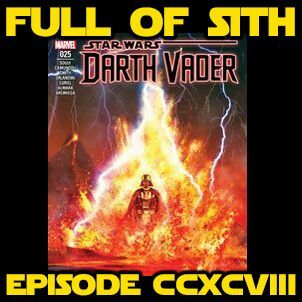 Bryan and Holly got together to talk about the explosive events of the most recent Darth Vader comic series by Charles Soule and others. They also talk about the recent news stories about information in that comic that might have been exaggerated or overblown for clicks. This is a deep dive into the lore of Star Wars and the psyche of Darth Vader, so strap in. If you haven’t already, join our new Facebook group and join in the discussions with us and other listeners at – ... See More http://facebook.com/groups/FullofSith If you like the show, please leave us iTunes/Stitcher reviews and share us with your friends and family! We’d greatly appreciate it.